A sleeveless Trench Coat and $500 Nordstrom Giveaway! Okay, okay, ill stop talking! If this outfit is getting you excited to expand your new fall and winter wardrobe, see below for details of the $500 Nordstrom gift card GIVEAWAY!!! Good Luck! Today I am ecstatic to be collaborating with a group of amazing bloggers to bring you a chance to win $500 to Nordstrom! Just in time for the colder weather and new winter wardrobe. Now for the REALLY good stuff! To enter the $500 Visa gift card giveaway, simply complete the Rafflecopter below. The giveaway is open until 11:59pm EST next Friday (October 23rd) and remember, the more entries you complete, the more chances you have to win! For fashion lovers around the globe, this giveaway is open internationally. Oh and be sure to go say a big hello to all the fabulous people involved. Good luck! Fabulous outfit! A sleeveless trenchcoat is definitely on my to-buy list! And I cannot get over those gorgeous trees in the background – they look almost fake! I would buy some Sam Edelman booties and jeans for post baby! I would love to buy some Birks, a cute fall/winter (which is basically still fall in California 😉 ) dress, and use the rest to buy the Hubs and baby a couple of nice things too! I'd love to put it towards aqua Hunter boots, a long winter coat, and a new Nixon for the hubs! If I, by some miracle, won this- I would (want to) buy a few nice pairs of Hudson or higher end jeans because I won a pair of Hudson jeans last year and they are amazing! I totally would buy one pair of skinny jeans with it. I would love a pair of riding boots from tory burch or a purse from tory burch or Rebecca Minkoff. I definitely need a new wardrobe so I would try to stay away from the more expensive *treat* type accessories but I have wanted them for so long! I also want a really nice coat, either a camel or blush 'peacoat' or something similar to my white 10 year old CK puffer/parka with fox fur trim hood. Thanks so much for this! We don't have a Nordstrom near here (it's about an hour away) but my online wishlist is huge and I would love to finally get some things on it! I literally would cry if I won! I would love to buy boots and trench coat. This look is chic to the max!! Love the long trench coat look. 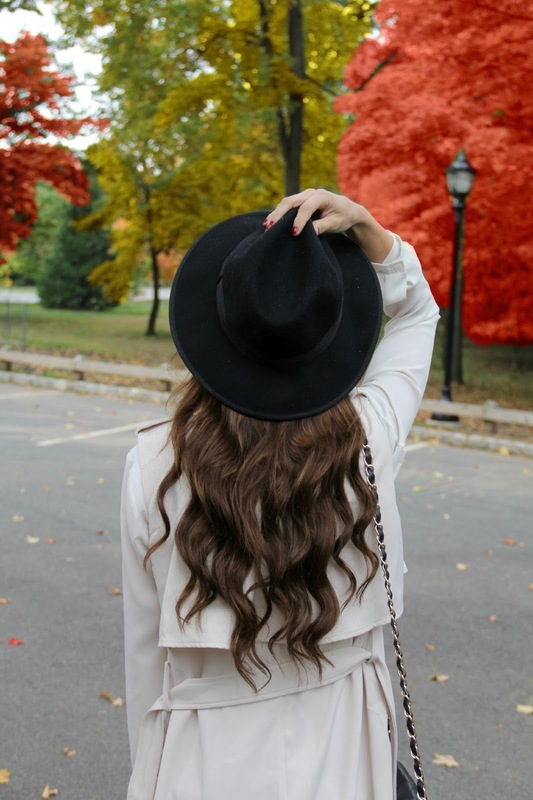 I love your hat and the long trench! Those booties are perfect for fall as well. Thanks for the opportunity to win! I'd probably splurge on a great pair of jeans and booties! I love this long trench on you and the hat gives it almost a boho feel. Gorgeous! With Fall in Utah, I could definitely boost my college wardrobe with a new pair of booties and a pair of jeans. I will get a down coat. I love the long line cardigan and the black accessories you paired with this look. You look so cute and very Fall appropriate.